This is our third refight of Lobositz. A great one to do over and over again! Our regional group has been gaming the SYW for seven years. Recently we labeled this Cycle #1. Reason? We want to start over. Before we start Cycle #2, we decided to have five final games. Completed so far were East Prussia, Silesia and Bohemia; the Lobositz game in this posting. Yet to come are two last games; one in Westphalia and another in Canada. 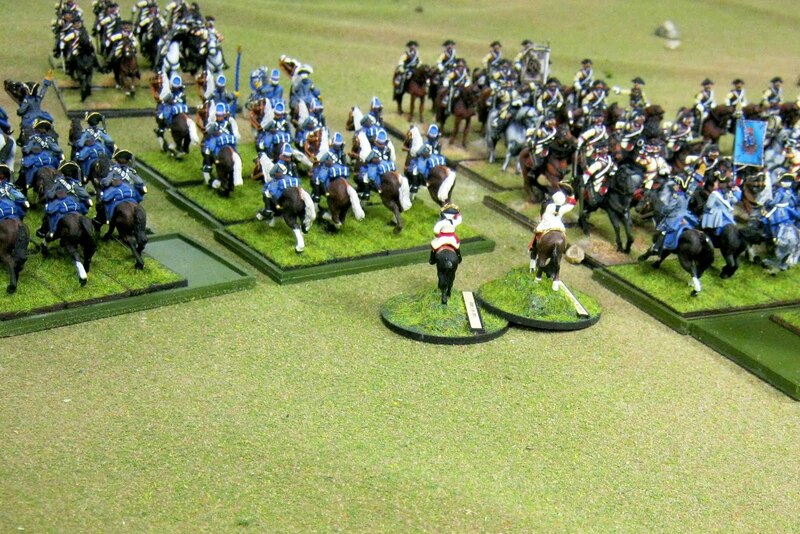 For the one in Westphalia we might use our 1:20 units, my old Tricorne lads and Jim's new Mindens supplemented with some other collections. Yes BAR can be used with 1:20 forces. Once in a while my photos and narrative are limited mostly to my position in the line of battle. Reason? 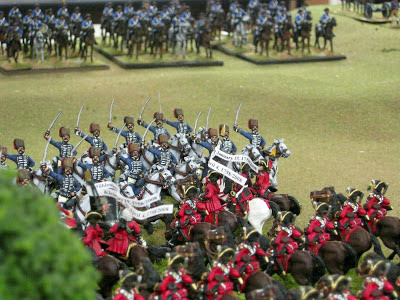 Simply to limit my point of view to what my personal command miniature could probably see and interpret. Here we go! A few turns after the historical fog lifted, Austrian forces got into action along the Morellenbach Stream. 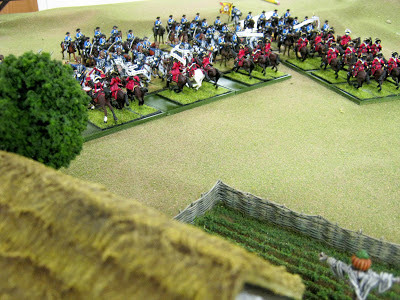 One battalion guards the bank while 30mm Suren Lanciers de Saxe commence crossing the stream to flank the Prussians or cause mischief. The Lanciers were no longer in existence but we like to use them. 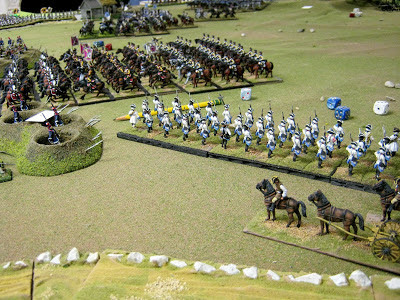 In the distance Prussian hussars on white horses are about to be engaged by 28mm Elite Miniatures Saxon Rutowski Chevaulegers. 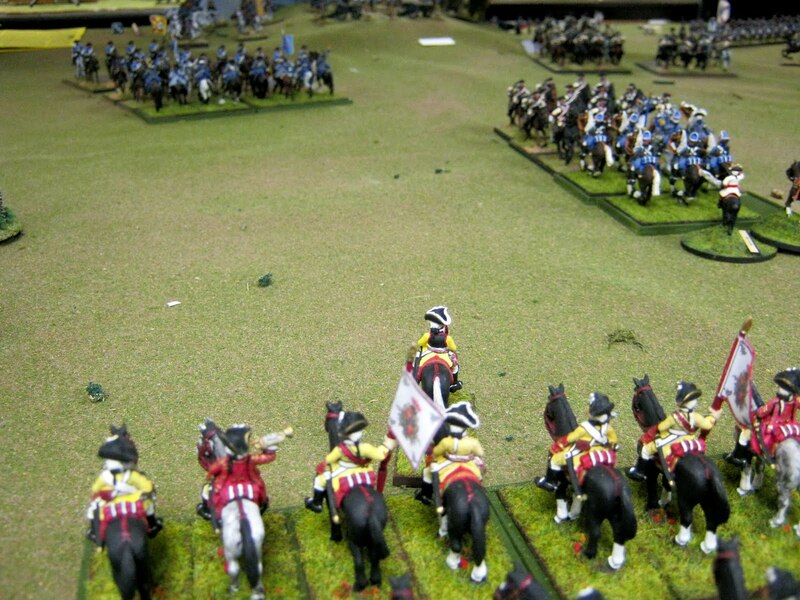 Though labeled light cavalry, Saxon Chevaulegers were certainly not light horsemen. Rate them heavy horse. This regiment was probably bottled up at Pirna. Again...we like to use them. CRASH! 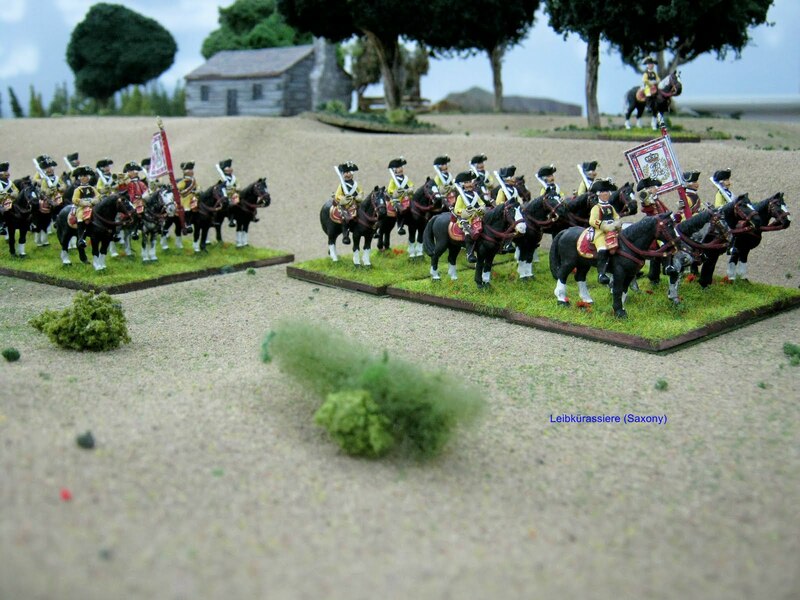 Beyond the Rutowskis a three squadron regiment of Prussian dragoons canters onto the scene. Trouble! Streamers on our BAR units are for exceptional battlefield accomplishments over the years. Both Jim and I have several honored units. More Rutowskis ride forward to help. It is a four squadron regiment; two engaged and two in reserve for a total of forty-eight castings. The extra squadrons pitch in. Attrition has affected both sides but the Saxons are losing badly. They will eventually be entirely bested and lost. Advantage Prussia! Meanwhile to the right of the Rutowskis rides the von Brühl Dragoons. 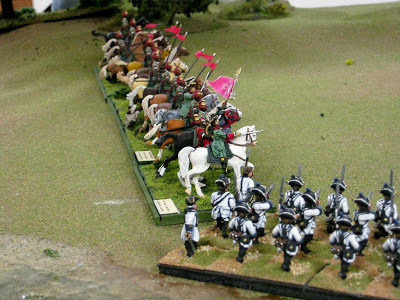 These are 28mm Elite Miniatures in tricornes rather than the celebrated fusilier hats. I explain my quirky reasoning why later for the hats. Prussian cuirassed horsemen are their target. Wrong or right I chose to have them only wearing fusilier hats. 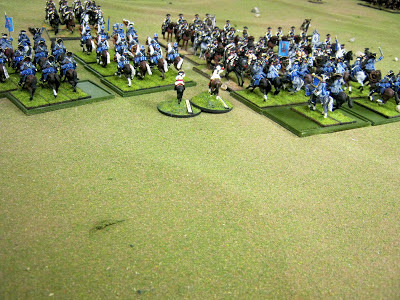 These are Eureka 28mms riding Elite Miniatures horses. Your von Brühls should probably all don fusilier hats to reduce chattering amongst nabobs. Honest doctor, I did it only so I could differentiate my horse grenadiers from the rest of the men. Grenadiers you know! Eventually my newest unit, the Saxon Leibkürassiers trotted onto the field. These had been patiently waiting in reserve on one of Jim's Back Tables waiting for their moment de l'Bataille! These are snappy Eureka 28mms. Magnificent castings! Here they are before the battle. Their commander observes them from a rise of ground. There are twenty-five castings; two squadrons. I've wanted to do Saxon kürassiers since the 1970s. Now finally they ride to battle. Kürassier is the German spelling of the French word Cuirassier. Remember the Lanciers de Saxe? 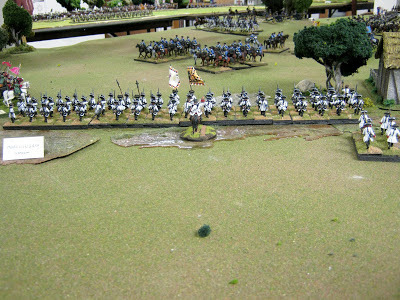 Here they are across the Morellenbach Stream formed and ready to charge. 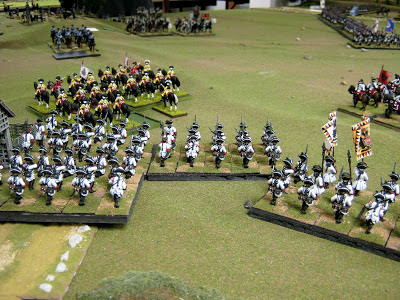 They could not be ignored and would pull Prussian cavalry from the distance to them. A good thing for Austria! Soon enough that Austrian battalion previously mentioned crossed the Morellenbach in disorder, stayed in disorder rather than reform to advance to the beat of the drum to cause unignorable pressure. 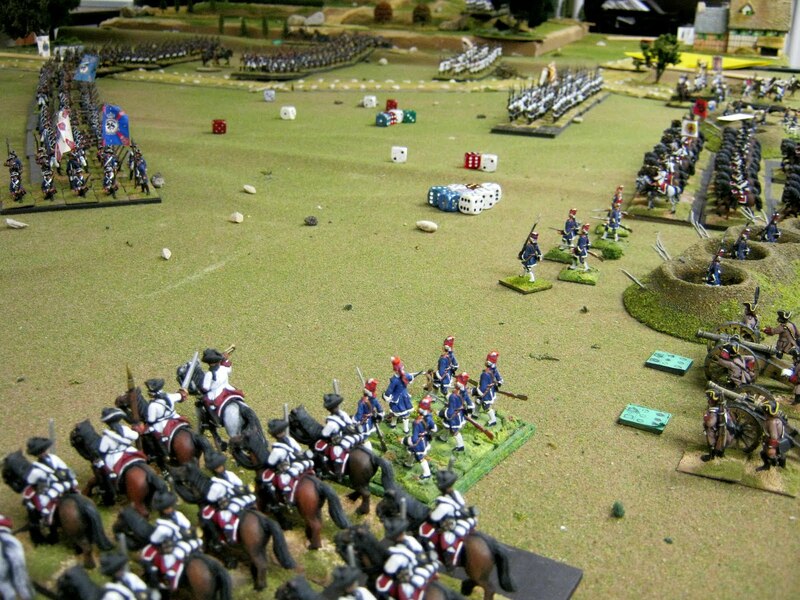 A Prussian battalion came forward to stop it. Sometimes it's prudent to not reform. You take your chances, you see! Push. 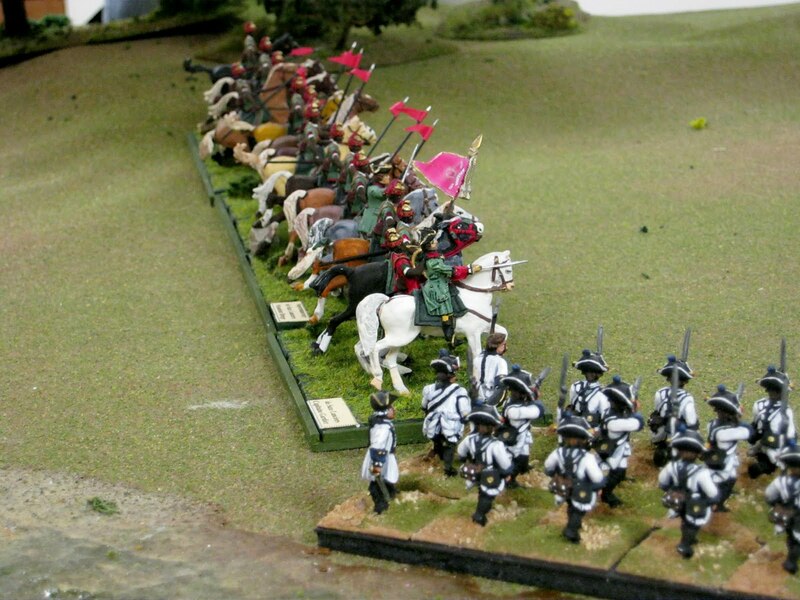 The Lanciers de Saxe trot over to cover the left flank of the Austrian infantry. To the right of the previous image are two more Austrian battalions who have crossed the Morellenbach. Forward of them are the Leibkürassiers and not much Prussian horse any more. The game soon stopped. The Austrian Left Flank was deemed by a post game conversation to eventually be victorious. 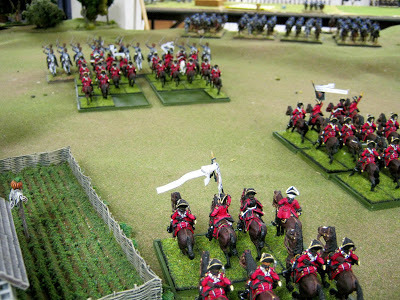 Austrian infantry had a 3:1 advantage, Prussian horse was ready but greatly diminished and the Saxon kürassiers were ready for a potential coup de grace or at least a lot of mayhem. Advantage Austria. 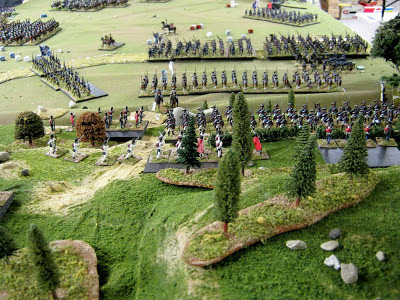 Prussian forces heavily pressed the Austrian Center. 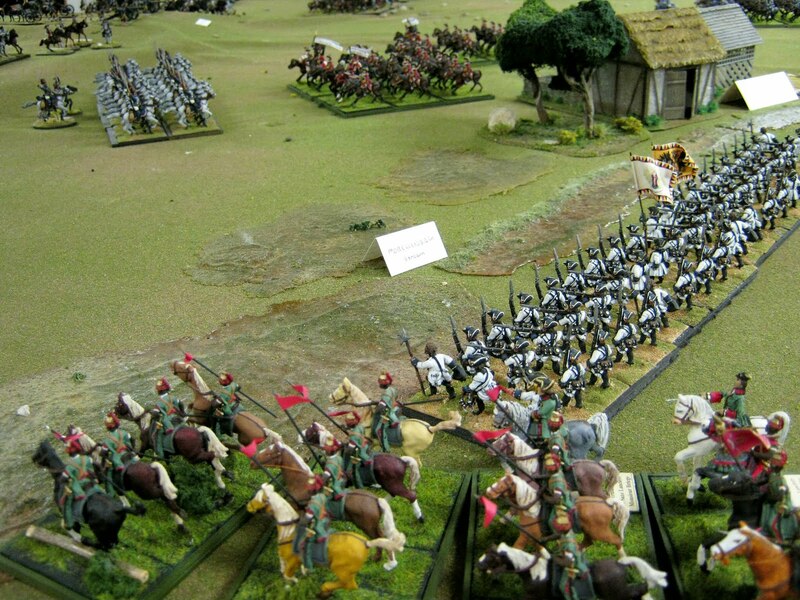 Notice the Macedonian Horse Phalanx of Prussian kürassiers in mid-image. Scary I'll tell you! Read Der Alte Frit'z blog AAR mentioned at the beginning of this post to discover what amazing thing happened. Truly astounding! Really! Advantage Austria - eventually. Way at the top of the image are my Saxon von Brühl Dragoons. The Prussian Horse Phalanx is gone from the left of this image. See Der Alte Fritz's AAR why. Above is the Austrian Right Flank. Cast your eyes and consideration upon the magnificent Prussian infantry battle line nearby. Though the game ended at this point due to time running out, all agreed these would probably sweep the Austrians away. Advantage Prussia on the Austrian Right Flank. Here is the Austrian Extreme Right Flank looking down onto the west face of Lobosch Hill. Again see Der Alte Fritz's AAR. The Prussians would be victorious in their ascent. 1) I had no idea who won the game because my attention was mostly focused on the Austrian Left Flank. Things looked bad elsewhere to me. 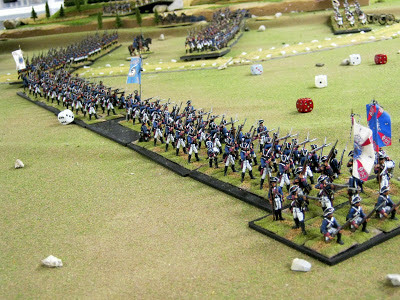 A post game chat deemed the Austrian Left Flank and Center victorious while the Prussian Left Flank and Extreme Left Flank were considered winners. Der Alte declared the game a draw. All agreed. 2) Bravos, applause and tips of the hat to Jim for hosting this really fun wargame. 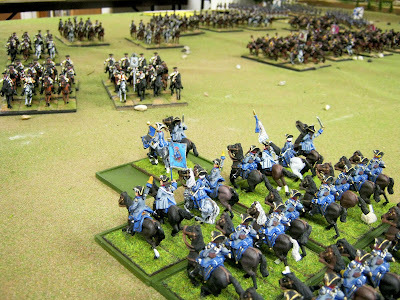 The back and forth aspect of our cavalry battles simulated history well, cavalry got to shine early instead of late in a game and the battle swirling near and on the Lobosch Hill was striking. 3) 18th Century music, great chow, gorgeous terrain and companionable pards made the game a great success. There is something about Lobositz which is singularly entertaining and different. You should try it. 4) It has been fun limiting my narrative to mostly the Austrian Left Flank. 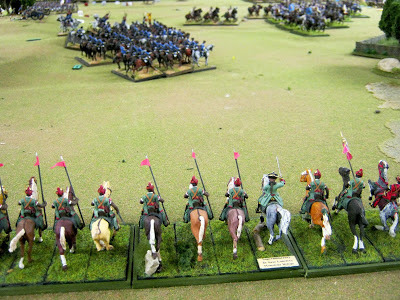 Additionally, there was something satisfying about commanding the two Saxon medium regiments of cavalry till mid-game rather than a lot more units. A brigade action can be fun. 5) You can do it too. BAR handles the back and forth nature of cavalry battles with long movement rates and options immediately after most melees to rally back, stay in melee and/or pursue; immediately in the same turn. 7) Remarks welcome, if you please. 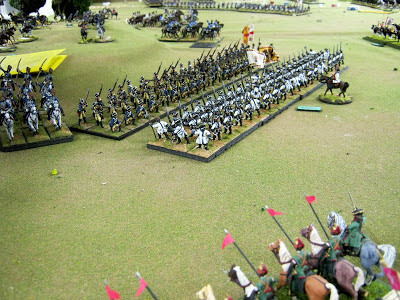 Great battle report! I am jealous of the long term gaming you and the others have been able to pull off for the SYW. This is something I have dreamed of doing for years. Great batrep and fantastic pictures! Cavalry is really impresive! Great pics! 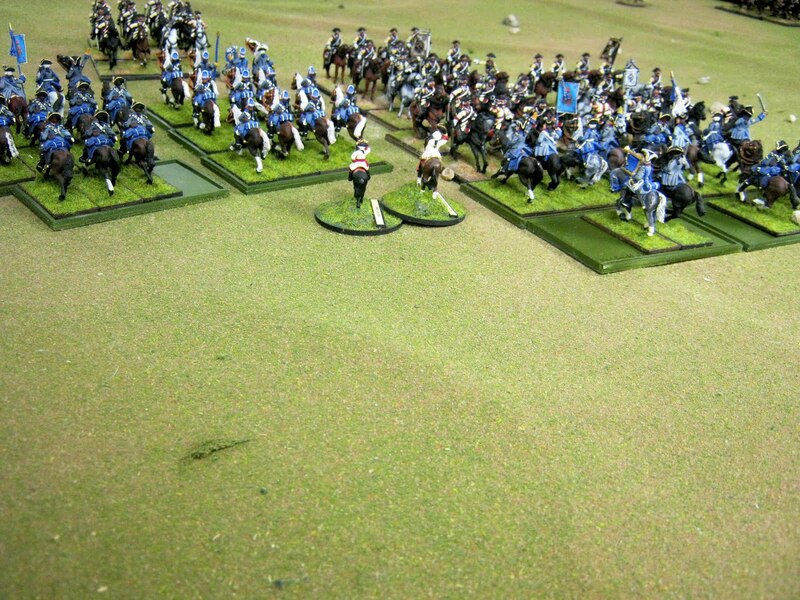 Also, I think was pretty right in giving fusilier caps only to the horse grenadiers. That looks terrific, and it sounds like you had yourself an engrossing game. I love the streamers, and how you've built up histories for your units over time. Fabrizio! Thank you for the link about the von Brühl Dragoon hats. I added it to the text above. Much appreciated. Wow, what an awesome game. I wish I were there.